In stock -This product will ship today if ordered within the next 7 minutes. Shake or blend with fresh fruit or vegetable juice. Start-up: 1-2g ( 1/2 tsp) per day, with food, for one week. Maintenance: 3g (1 tsp) per day, 1 hour before meals. Optimum supplementation: 3g (1 tsp) three times per day, 1 hour before meals. For a delicious smoothie blend one cup of freshly squeezed juice, one banana and spirulina to taste. Below are reviews of Lifestream Spirulina Powder - 100g Powder - Best before date is 30th April 2019 by bodykind customers. If you have tried this product we'd love to hear what you think so please leave a review. 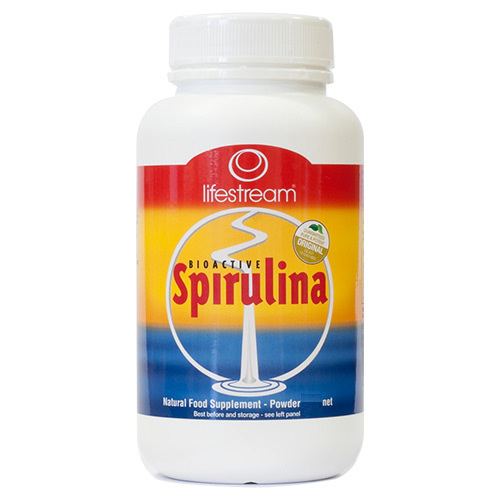 Question about Lifestream Spirulina Powder - 100g Powder - Best before date is 30th April 2019 What is the difference between Spirulina and Blue Green Algae? Question about Lifestream Spirulina Powder - 100g Powder - Best before date is 30th April 2019 How should I take this?